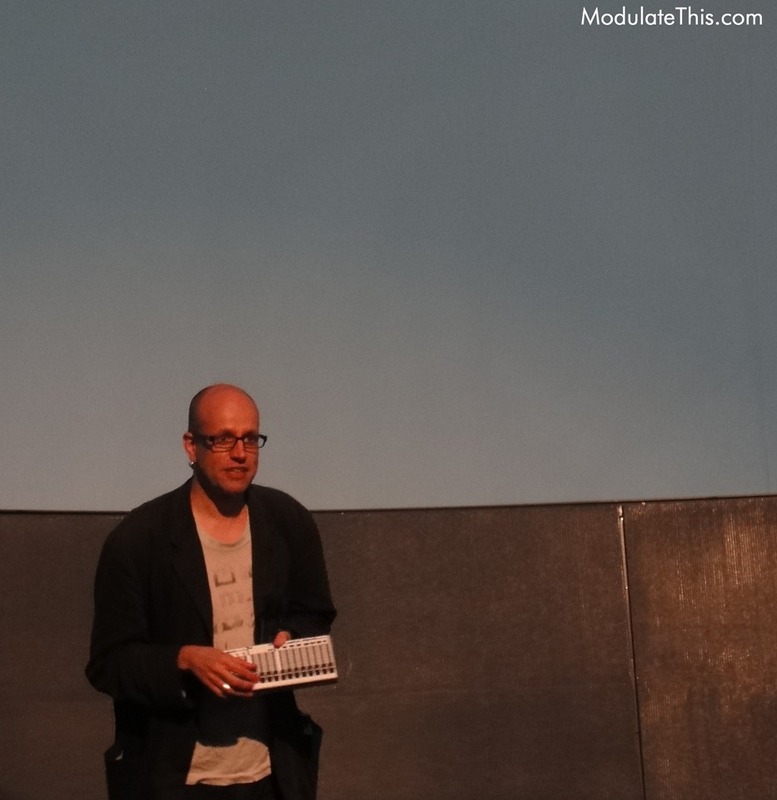 Robert Henke of Monolake and one of the creators of Ableton live came through Denver and performed his work "Intersection" on Monday and then delivered a lecture at Denver University on Tuesday. This invitation only event was hosted by The Digital Media Studies program at the University of Denver. This was a real treat as this was one of only a small number Robert's performances in the US. Here is a show report. "Intersection" is a work which incorporates “field recordings made in Hanoi in 2009, reconstructed through narrative, music and sounds”. 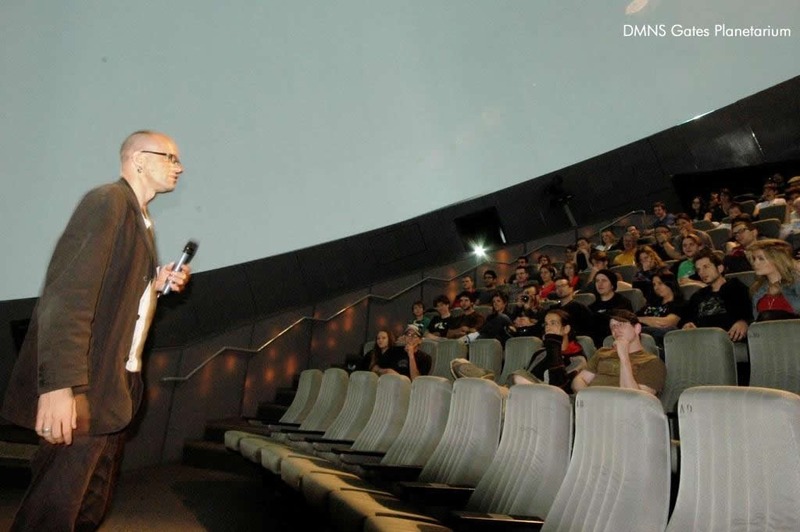 The performance was presented in the context of the amazing full-dome digital theater of the Gates Planetarium. Before the show started the event host Trace Reddell, Ph.D. (Director, Digital Media Studies University of Denver) introduced Robert who talked a little bit about the piece and the show. Robert described the show as a real-time collaboration between himself and Gate’s Planetarium’s own VJ / Pilot / Scientist Ka Chun Yu Ph.D. on visuals (pictured below). They had only met a few hours before the show and the concert was almost completely improvised. Intersection is entirely created using field recordings taken in November 2009 in and around the city of Hanoi in Vietnam. The field recordings were transferred to a laptop and layered, filtered, slowed down and processed in many ways to form the composition. The idea of using recordings of day by day sounds as material for musical expression is not new. It has been pioneered shortly after the advent of tape recorders in the late 1940 by the French composer Pierre Schaeffer and others. They coined the term 'musique concrete' for these kind of works. 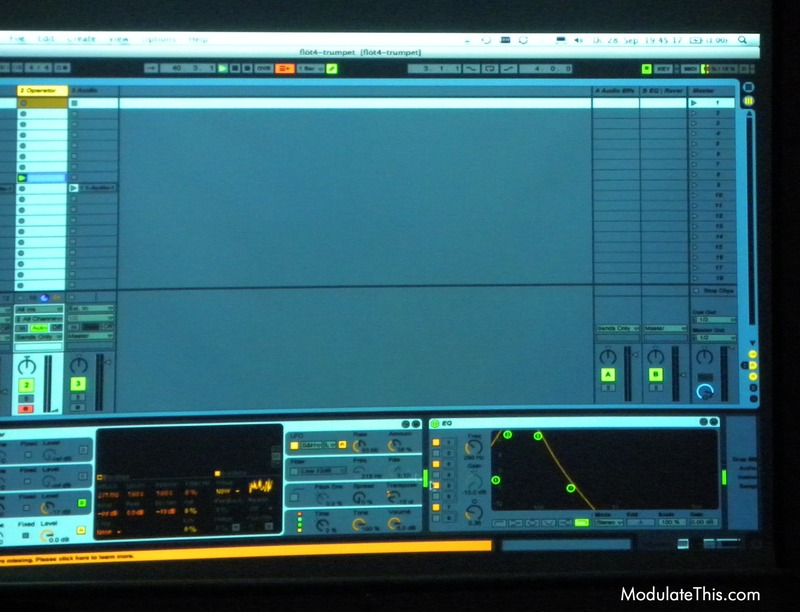 Robert was using Ableton Live on a laptop along with a multi-channel sound card. He used the portable controller below to control fades, filtering and more. Of course, he was using Live to control clip playback. 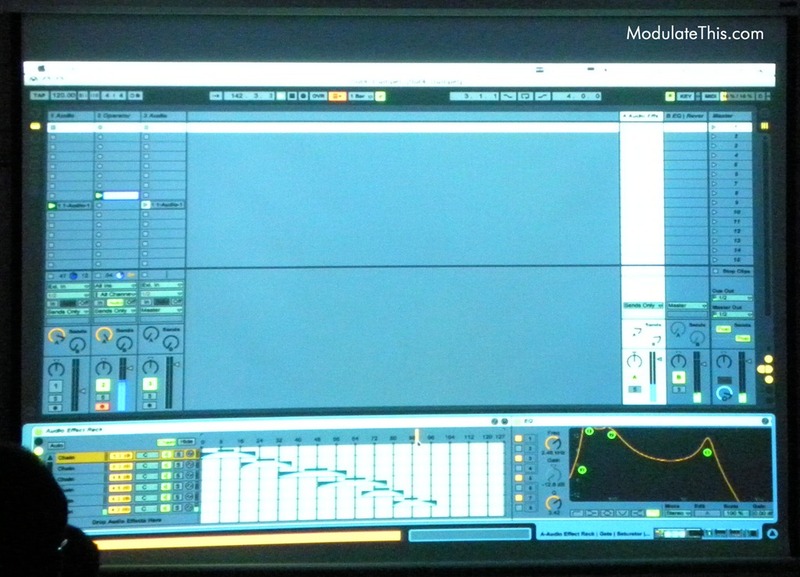 He mentioned using follow actions and I believe he was also using some of his custom Max for Live devices. Uniview is a visualization of the known universe, with the ability to fly the user and audience through a virtual simulation at multiple size scales. We can thus start off around something at a human scale, and zoom out to the edge of the observable universe billions of light years away. For the performance the other night, Robert wanted the visuals to be slow and to evoke star fields. Words can’t quite capture it, but here is a taste. The show started with almost a completely black dome. The music and star field slowly evolved and became more present. A bright star appeared, slowly moved across the dome then started coming towards us. As the star got closer it became a huge sphere or stars. Through time, we were brought into the center of the sphere which began to rotate. There was parallax-like against stars that were outside the sphere - then we tumbled. Awesome! This transition took like 15 minutes so it was quite serene most of the time. For the performance the other night, Robert wanted the visuals to be slow and to evoke star fields. We therefore started out in interstellar space far from the Sun, and moved in. We spent much of the time floating through the Oort cloud, a hypothetical spheroidal distribution of 2 trillion comets around the Sun. In the last part of the performance, we also zoomed inward to view the Kuiper Belt, a toroidal distribution of icy bodies just outside of Neptune's orbit. And that was it — plus a fistful of tricks and changes in the viz parameters to make the dome imagery go beyond that of a typical science talk, and reflect Robert's vision for the evening. I’d describe the music as ambient, spatially dynamic, slowly evolving layers that come together in a complex way that your brain seems to make sense out of as your perception evolves along with the piece. An interesting mix of drones, metallic textures, with a few sounds that were almost familiar way in the back of the mix. All moving around in the 3-d space of the dome. The combined visual audio experience demanded you calm your mind and senses a bit so you could properly take it in – and then you could get lost in it. Very immersive, and very nice! As they were improvising, you could sense Robert and Dr. Yu reacting and playing off each others creations. Robert described it as a Jam. The show which was around 45 minutes in length ended with a very slow fade to white and complete silence. 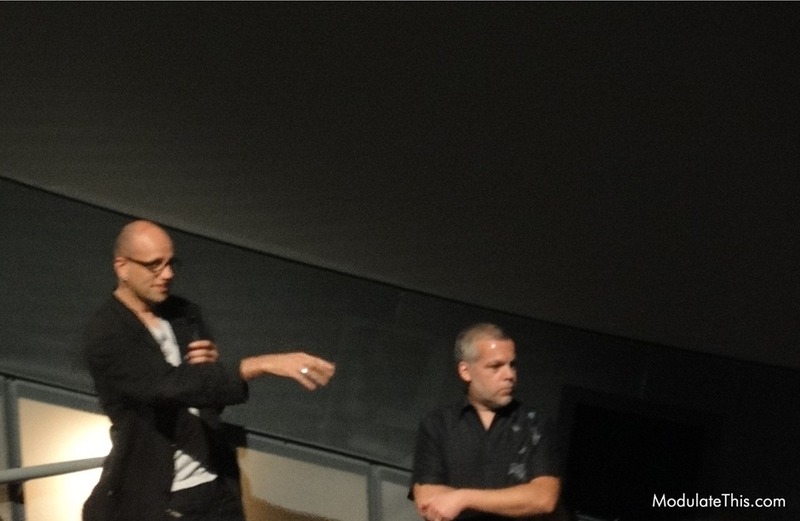 Robert ended the performance by saying “you are now only hearing the ambient noises of the planetarium”. Applause, then Q & A. Fantastic! 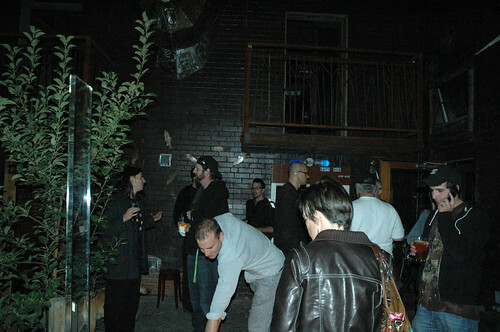 A reception followed at Forest Room 5 which was hosted by the Ableton Denver User’s group. I want to mention that attendees were a mix of students, academics, and artist. It was really nice to mingle and meet new people including Robert and the reception was a great way to build community. 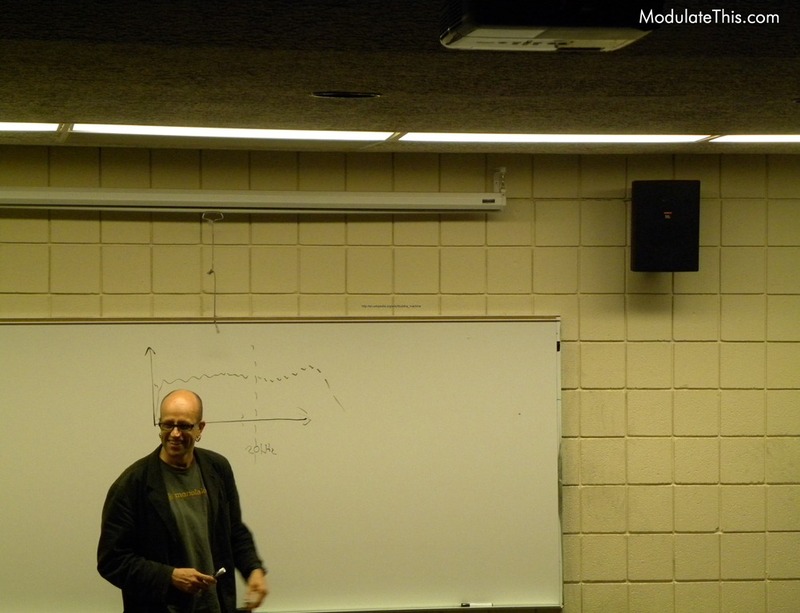 The Digital Media Studies program at the University of Denver hosted a second night with Robert Henke. This time it was a lecture on campus. Robert came with no prepared material, and then gave an amazing one hour and forty five minute lecture! Instead of being some sort of pure technical lecture on electronic music or Ableton Live, Robert talked a lot about his creative process and journey as an artist which I personally found fascinating. As a speaker Robert was animated and passionate about his art and craft made a point to connected with the audience. Below is a shot of him talking about some of his early work with a Budda Machine. Applying an existing process to a new context to achieve a new result. Struggle, taking risks, and trusting in your own work and intuition in the creative process. Embracing the unpredictable nature of iterative creation and how you often end up with unlikely results (which can be a good thing). He discussed how he often prefers low cost portable digital field recorders as he ends up capturing more sound in the moment. He is currently organizing and naming field recordings by the name of the project or song rather than organizing like sounds together. ardware and can simply keep piling on EQ’s in the chain. It was interesting to see Live used in such an unconventional way. One very cool part of the lecture was when he demonstrated how he built a “wave guide model” using standard devices in Live. He then used racks to create instances to tune pitch for each note. 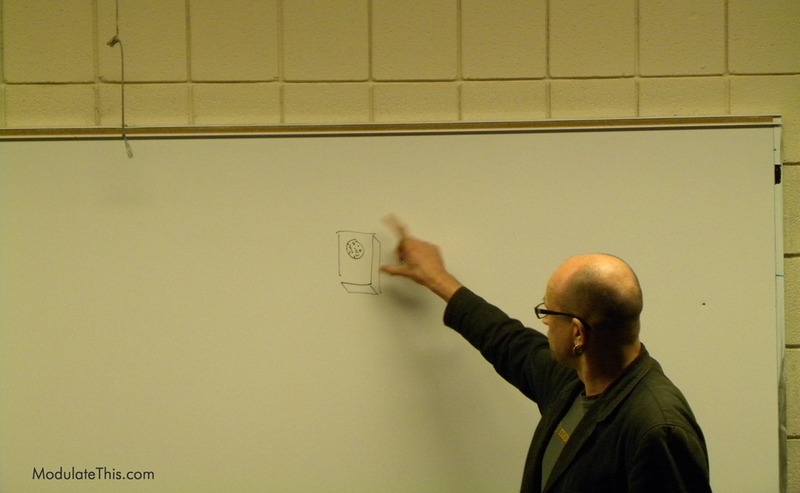 He also discussed the value in building your own devices in tools such as Max for Live. His point was that something special happens when you invest time in your own instrument and as a result you end up using it more, which then drives further iteration and enhancements, which then influences artistic results in unexpected ways. The other advantage is you can solve problems that relate specifically to your art and performances. He sited his use of his own devices such as his circular Doppler effect. He was asked how he balances all this which lead him to relate some insights on working with deadlines and the importance of working environment and balancing coding with other aspects of artistic creation. It was simply a great lecture and I felt very fortunate to get a glimpse into Robert’s creative process. 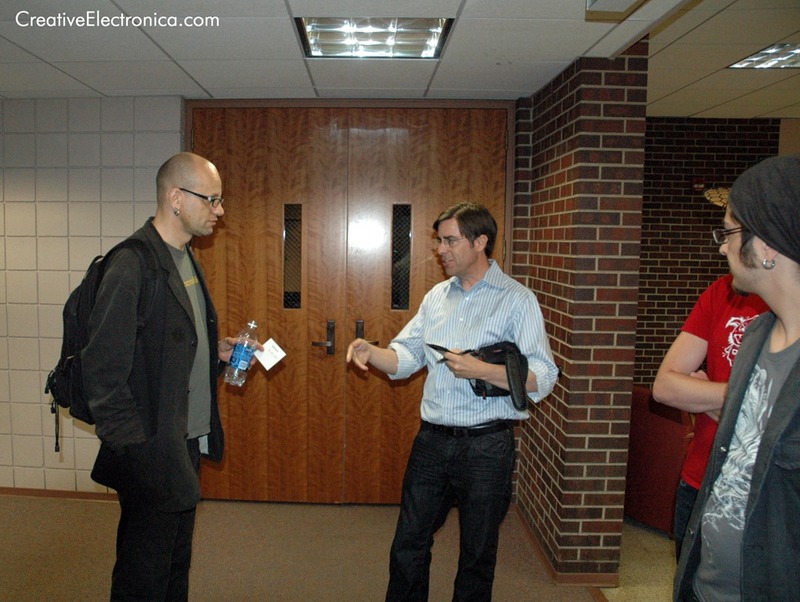 One thing I really liked about this event was that it was structured for a smaller intimate lecture setting where we could meet Robert afterwards and personally thank him for the shows and for his contributions to our own art via Ableton Live. Robert Henke for taking the time out of his schedule to play and speak in Colorado. 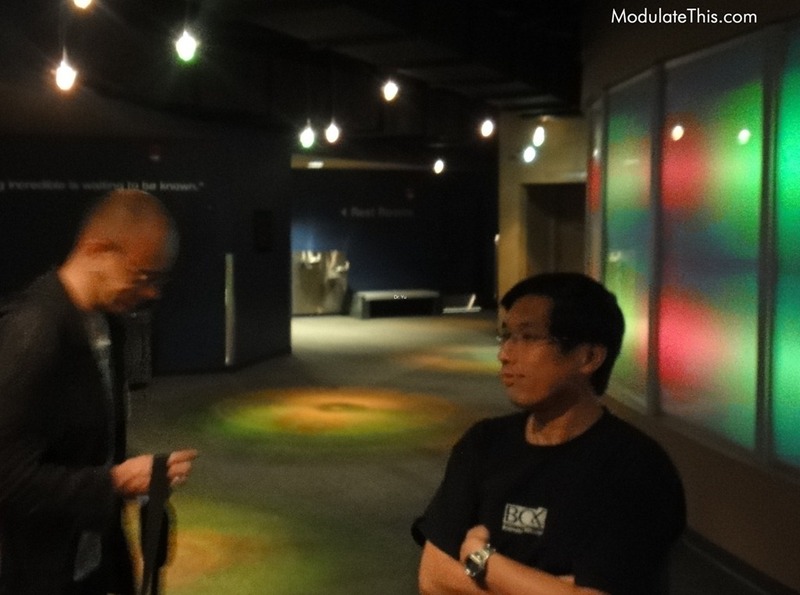 Dr. Ka Chun Yu (DMNS Gates Planetarium) for his performance on Monday. Dr. Trace Reddell (DMS) and Darwin Grosse (DMS & Cycling 74) for organizing such a fantastic set of events and including me and others from Ableton Denver Community. Dan Neafus (DMNS Gates Planetarium) for introducing me to Trace and for providing such a great venue for the concert and for sharing pictures with this post. Marc (Ableton Denver & Creative Electronica) for organizing the reception on Monday, gathering the Abes and sharing pictures for this post. Marc has shared even more photos on the Ableton Colorado Flickr Photo Stream. Thanks for the write up, I was really excited to attend night 2 but was called into work. Kinda bummed, but I was pleased to attend the night @ the Planetarium. Completely inspiring, I’m currently working up an ambient set for a performance I have on Oct 10th. Small venue, intimate setting… I’m working on a set that features a matrix of aux sends so that i can perform in “pseudo surround” (i’ll be playing in quad). Great post Mark! 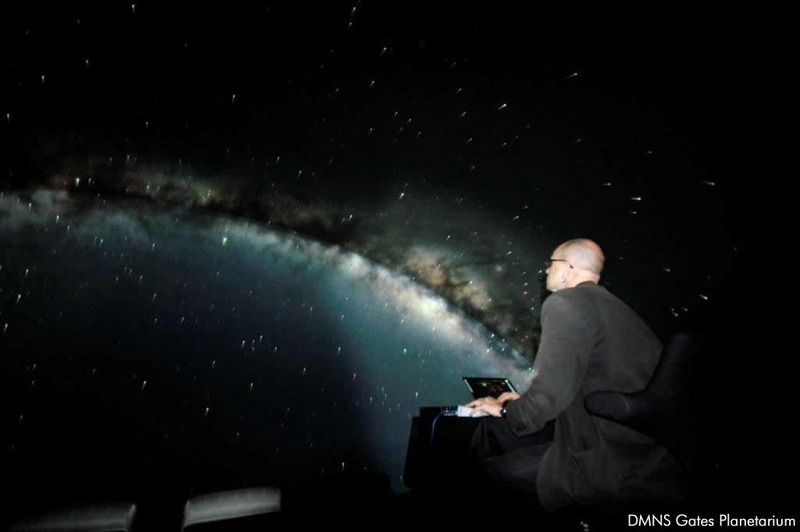 I’ve never been able to experience a planetarium performance like this, always something I’ve wanted to do..I have friends in SF who’ve seen Robert Rich perform at a planetarium there and described it as a transcendent experience….wish I could have been in Denver for a couple of days but this is the next best thing! I am working on a decompression post on some thoughts and ideas from the 2 days with Robert. You did a great job documenting this event – thank you! A few ideas of mine changed on sound and sound design. Partly Robert but to a large degree from the contrast he provided to conversations recent in social media. Roberts elegance, straight forward approach, and grace in tackling a problem showed the often overlooked power of Ableton. I find DJ’s unfairly mad because they need to warp all big tracks and reference a lack of creativity in the Ableton genre (ears must be closed). As frustrating as this can be I was uplifted by sharing space with Robert (much like any great artist). When I discuss Ableton in the DJ realm I am going to try to retrieve that particular mental state (a frozen track?) from his DU presentation. That was the serious business! My mind was, if only for a minute, clear on the topic of sound and music production. Thanks goes to Robert. Thanks for the correction Robert. I’ve modified the article. Hi Mark, thank you very much for that lovely review! 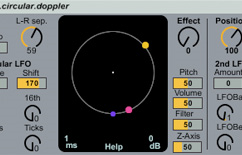 For the sake of precision, I feel the need to slightly correct you in one detail: Ableton was founded by my former Monolake partner, Gerhard Behles, a former Native Instruements developer, Bernd Roggendorf, and a finance person, Jan Bohl. I was asked to become a founder but refused the offer because I wanted to still make music as my main occupation. However, as soon as the company started thinking about the actual product, I became part of the team, and several very important decisions about the general ideas behind the software came from discussions between Gerhard and me. 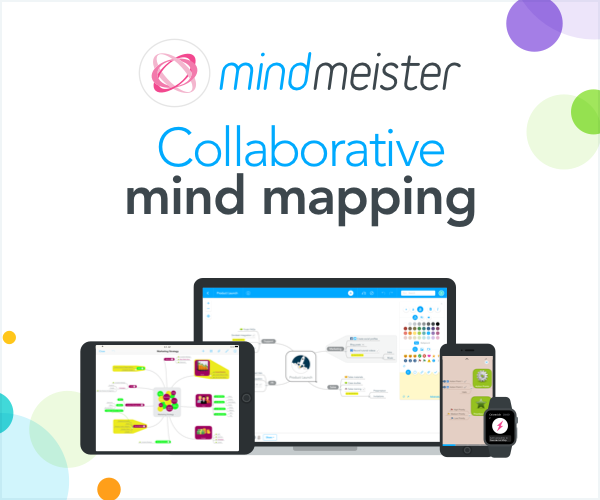 One of the main contributions during the last years was the “real world” testing and discussions about how the software is actually used for several tasks and how it can be optimized for this.